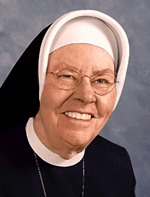 Sister Mary of Peace Slater, I.H.M. Sister Mary of Peace Slater died Jan. 4 in Camilla Hall, Immaculata in the 72nd year of her religious life. She was 96 years old. Born in Philadelphia, Sister Mary entered the Congregation of the Sisters, Servants of the Immaculate Heart of Mary in 1946 from Incarnation of Our Lord Parish in Philadelphia and professed her vows in 1948. Before her entrance into the congregation, Sister Mary taught at Hallahan Catholic Girls High School and after her profession of vows, she taught in secondary schools in the Archdiocese of Philadelphia and the Diocese of Harrisburg. After serving on the staff for 12 years at Camilla Hall, Sister Mary’s last assignment was to the Apostolate of Prayer. The Funeral Mass was celebrated Jan. 9 at Camilla Hall. The principal celebrant and homilist was Msgr. Joseph Logrip; also concelebrating were Oblate Father John A. Kolodziej and Father Stephen F. Leva. In addition to her congregation, Sister Mary is survived by her sisters, Sister Agnes Frances Slater, I.H.M. and Mary Katherine Meisner, and many loving nieces, nephews, grandnieces and grand-nephews. She was predeceased by her parents Raymond and Agnes Cush Slater; siblings, Sister Mary Natalie Slater, I.H.M., Rose McKnight (Robert), and Catherine Augustine.